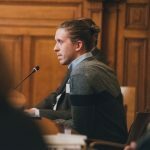 Michael is a project manager at the European Healthy Stadia Network, an NGO dedicated to helping national governing bodies of sport, league operators, clubs and their foundations to develop their stadia as health-promoting environments. Based in the UK, Michael has been directly involved in several UEFA projects, regularly undertaking bespoke health-impact assessments for UEFA’s club competition finals and major international tournaments and was directly involved in the Respect Your Health No Tobacco programme that operated at UEFA EURO 2016. Michael also coordinates the European football family’s support for World Heart Day. Sports clubs have a lot to gain from promoting walking and cycling to their stadia on a matchday. Encouraging fans and staff to include an active component in their journey will not only improve their health, through increasing their levels of physical activity, but can also significantly reduce congestion, pollution and subsequently air quality on a matchday, easing pressure on parking when space is at a premium. Michael’s presentation will explore several case studies from across Europe, including pioneering work at KAA Gent, in addition to an app-based active travel incentivisation programme at UEFA Women’s EURO 2017 and plans to promote walking and cycling at the forthcoming UEFA EURO 2020 tournament.